We had a vote at lunch about whether we should go home to Tulsa or chase up north. Since we were driving on our spare tire and the setup did not look to good my vote was on going home. Akos, the constantly positive Hungarian, convinced us on chasing so we went up to chase northern Kansas. Since we had a long sleep in and had a relaxed lunch, we were getting up quite late. 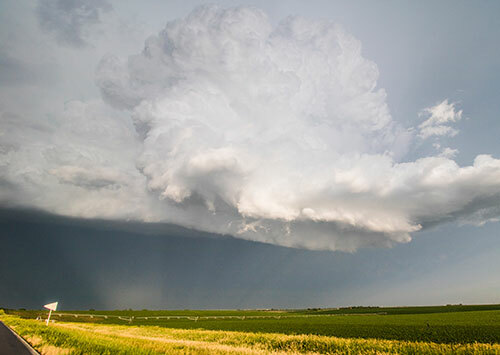 So, when a good looking storm started firing in central Nebraska and a brief tornado was reported it felt a bit bad that we were too late for the show. There was, however, a smaller storm to our west within reach so we went for this outlier storm. It had quite a bit of interference with other storms in the beginning but once it got re-organized it really started cranking! 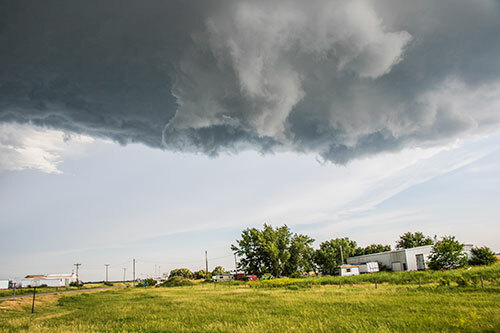 It rather quickly got a rotating wall cloud and had small funnels going on when we got off the highway into the smaller roads between York and Grand Island. At this time it was about 7 p.m. and the setting was perfect. We had the sun in our back, lighting the clouds up in perfect white. 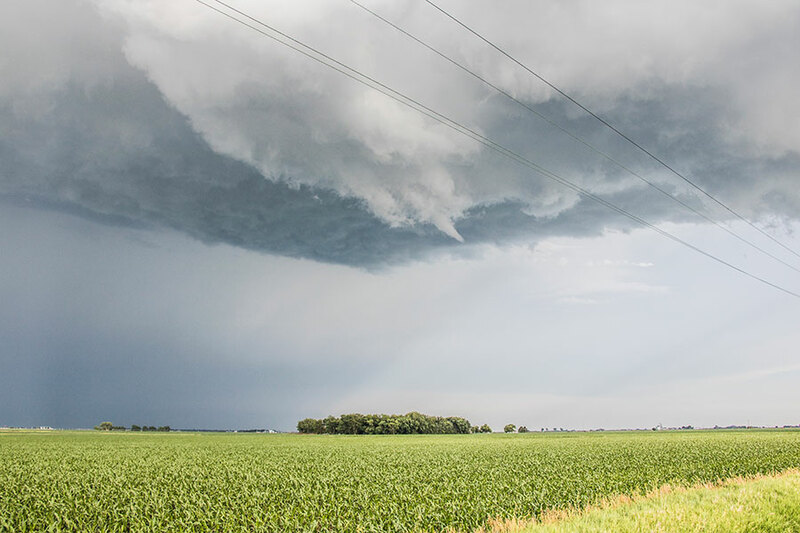 This LP storm was over green corn fields with blue skies here and there. 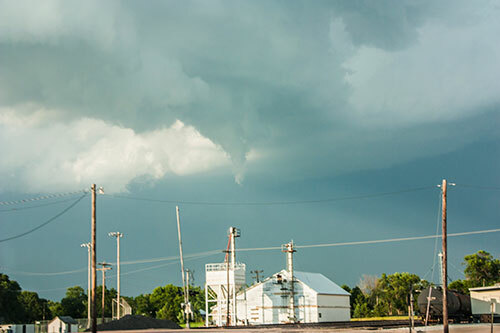 The storm produced several small funnels and finally started pushing one towards the ground. It came as far as a third towards the ground before it dissipated. 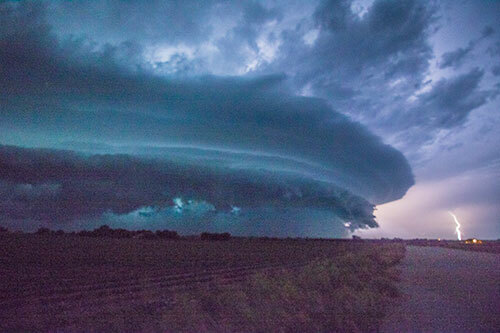 We would have been able to intercept a white small tornado, from a close distance with this beautiful surrounding – something that is at the the top of my storm chasing bucket list! Instead, our storm was about to clash into the northern storm complex (that had a few brief tornadoes). We expected this to kill the storm but maybe, with a bit of luck, give it one last push and provide some extra moisture. That is exactly what happened. The storm got into another gear just as the sun had set and it felt like it had rotation all over. Nothing that touched the ground though. Just as this happened our 4WD started malfunctioning as we drove on a muddy road. We managed to get onto a paved road with the 4WD still on as it was not able to turn off. At this point, it was starting to get dark and we started to drive out of the storm. We got into the precipitation while driving and that’s when the storm got tornado warned, right where we were heading. 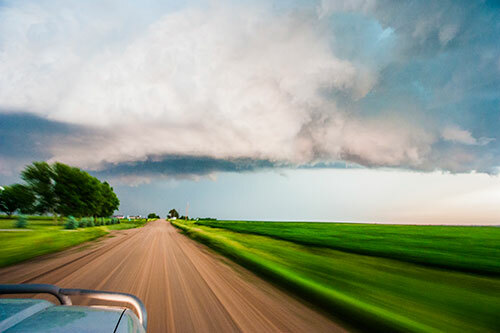 We drove east towards Wilber to get south and out of the storm, in which we had no real visibility any longer outside of the frequent lightning strikes. There had been strong, radar indicated, rotation over Wilber so we were not sure if the town would even be there when we arrived! We had to go on the south road from Wilber to get on a west option. Everywhere the road network made it difficult for us to get south and out, and we had storms both to our east and west. I am bit uncertain of the chronology here but somewhere at this point, we ended up in either an inflow jet or the RFD. The winds could have been as much as 100 mph when we turned the car to drive towards the wind. David (who was inside the El Reno-tornado) was an Ace in keeping calm and making good decisions together with Devin helping out with the navigation and Akos interpreting the weather. 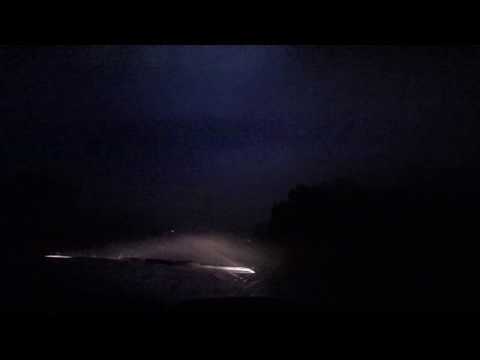 My dash-cam video from when we encountered the inflow jet. The clip is made up of two different sequences, 2-3 minutes apart. You notice it when the rain stops. Finally, we managed to get out of the storm, a bit shook up but nothing too bad. The storm never had a reported tornado but it could not have been far away. We kept south and managed to stay ahead of the storm while making brief stops to take photos, even though it was almost keeping pace with us. The storm eventually became a strong MCS and turned south east towards Kansas City causing havoc. On our way in to Kansas, we saw some absolutely insane lightning, especially anvil crawlers in the mammatus. It was absolutely stunning! The closest any of the funnel clouds came to producing a tornado that day was this one. After a while we were struggling to catch up with the storm base. Especially when our 4WD went down. I wonder if the people in these homes knew what was happening above them. This funnel cloud fortunately did not produce a tornado. If any of the funnels above the corn fields this day would have produced a tornado, it would have an incredibly beautiful tornado! The structure of this storm was quite amazing at times, especially with the sun in our back. The storm produced lots of funnels but most were small, like this one. As the sun had set and we started to lose visibility due to the darkness and precipitation, we decided to leave.